One year ago today, we did our successful Big Sunday event at the Cahuenga Branch Library, and now we’re heading toward another. 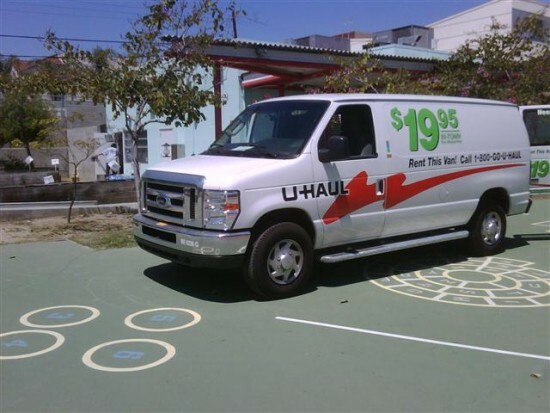 Just a block away from the Library is Lexington Ave. Primary Center, where I took the U-Haul cargo van onto the school campus and got to unload the mulch, water and t-shirts (and Pine-Sol too…I never requested any but they offered me the box anyway…). I also loaded my loaner bike into the van as a means of getting home. After unloading, I headed down Virgil and Hoover to Washington Blvd, where I filled up the tank ($25 worth) and returned it to U-Haul. Final cost was $49, grand total $74. I’ll put it in my Big Sunday project budget anyway and get reimbursed, so no worries. After returning the trusty van, I departed on my loaner bike and made a good bike ride out of it, visiting Jefferson Park, chilling in Exposition Park and riding through the USC campus on a bike for perhaps the first time (I was a commuter student back then and only bothered to ride my bike along the beach those days), amidst the crews packing up the numerous Festival of Books tents. And quite a fine warm day to be doing this as well.